I noticed that the file source package in Ubuntu on Launchpad is connected to the wrong upstream project. This obviously can't be fixed from Ask Ubuntu, but I am hoping someone can tell me what I can do to get it fixed (or, if for some reason it is best left unfixed, explain that). I believe I should report this as a bug, but how?1 Assuming I am even right about that, what project on Launchpad should I report it against? Launchpad itself? Ubuntu with no package specified? (This can be done, but it's usually discouraged.) file in Ubuntu? Note that this is not a problem with the file package itself. I don't think Launchpad will allow me to change the upstream connection myself. But even if it does, I don't think I should do that without more information, so in effect I need to file a bug report or otherwise enlist the help of others in an appropriate way.2 What should I do? 1 To try and figure out what to report this bug against, I re-read ReportingBugs, checked FindRightPackage (which does not appear to cover this sort of situation) and reviewed How do I report a bug? (Those resources are mainly for reporting bugs in software running on one's Ubuntu system, so it makes sense to me that I didn't find what I was looking for.) I also browsed and searched the Launchpad Help. 2 This is because, even though the current upstream connection is clearly incorrect, I'm not sure how it is best fixed. I can expand this question with more details about that on request, but I've avoided that for now because I don't want to create the appearance that I am attempting to report this problem here rather than in an actual bug report, and because I doubt it will affect the answer to my question. I don't think Launchpad will allow me to change the upstream connection myself. Anybody can register a project, but of course it's preferable if someone actually involved with the project creates it. There's no actual need for an upstream project for file to be registered in Launchpad: I doubt they will use it for announcements, code releases, bug tracking or anything else that LP offers. Christoph Biedl does not use Launchpad. This page was created on 2011-09-07 when the certificatepatrol package was imported into Sid. This is not a bug with LP - projects and upstream connections are created by LP users, so this is likely user error. I suggest that you ask the maintainer by posting a question on LP (questions can be converted to bugs and vice versa, if needed), but clearly nobody involved with file is interested in LP, so why bother? We own and register many projects in Launchpad, but we are always looking to hand them off to their official owners. They own projects like coreutils (whose maintainers also probably have no interest in a presence on LP). Not the answer you're looking for? 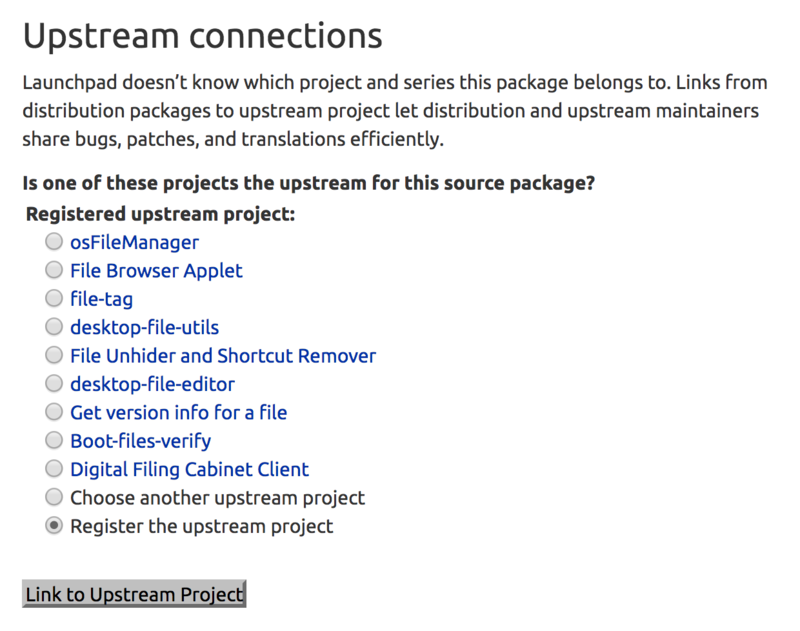 Browse other questions tagged bug-reporting launchpad source-packages upstream or ask your own question. What package to file general (usability) bug against? Whom should I ask to update a package to a new upstream release? How do I report a bug on Launchpad when I don't know which package it affects? The GnuCash bug tracker has moved. How do we fix all the Launchpad references still pointing az the old site?